Where has January gone??? For a long month it sure disappeared quickly. I accomplished much and wasn't sure the following would be one of them but I finally got around to putting them together. 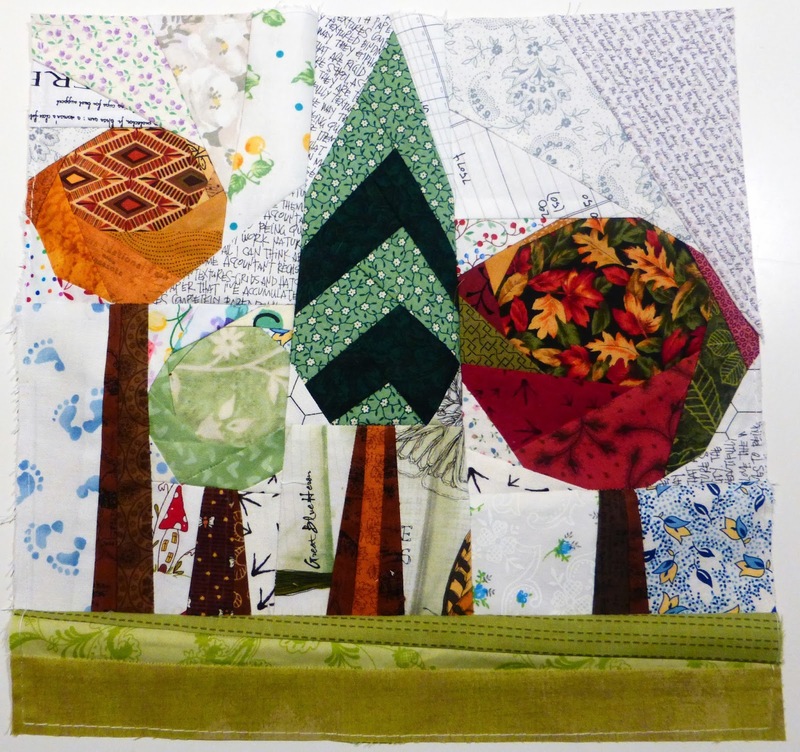 It is part of the Garden Quilt BOM from Quilt Art Design. Janeen has put together what looks to be a great pattern for us to make each month. Little did I know it was to be two blocks each month and therefore a little more work to squeeze in. I have decided to let loose and play with some low volume fabrics in this one. I am hoping the design will pop out each month even though so much is going on in the background. 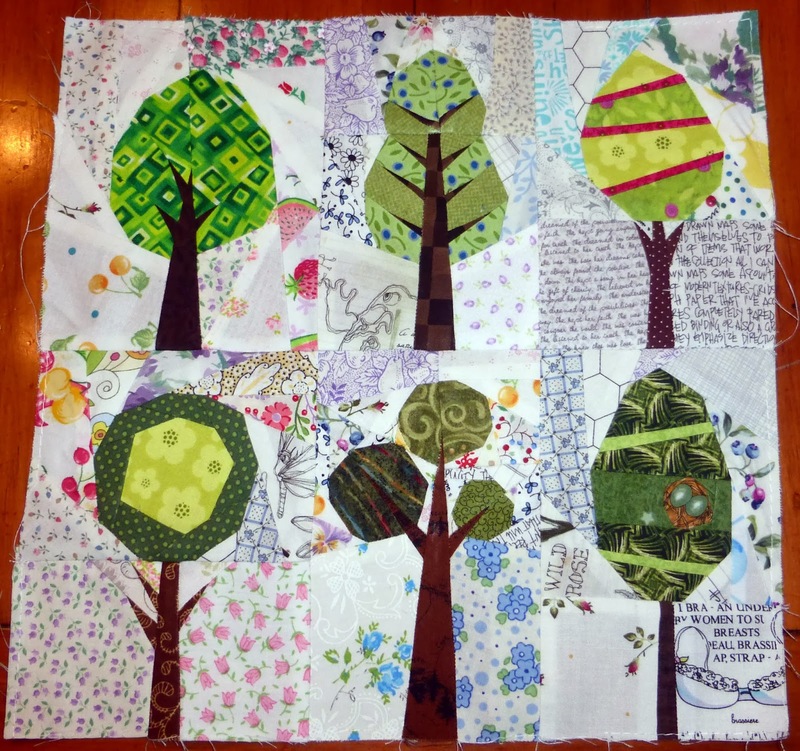 It is definitely new territory for me but I have decided it is both a great stash buster and each block is so fun to watch come to life and that is one of the things that already drives me to love paper piecing!!! What I learned in block two is these patterns are not mirror imaged as is standard in paper piecing so the picture Janeen has with the pattern is not the same as what you get when making them. While in block one the six trees went together smoothly...block two challenged me. Ideally I would have caught on sooner and put the trees together in the reverse order from the way they are now. I think the tall tree should have been to the right of the red tree and so on down the line. I had to make the tall golden tree over and mirrored it but the littlest tree has a flat side were it should have been reversed and then the flat side would have butted up against the golden tree. I know it is hard to follow my logic especially when I did mirror the golden tree. I will stop know before I lead you to drinking...Not a big one on redo-ing blocks I will live with it. Did anyone else making this block have this problem ??? In the future I may need to analyze her patterns more closely before jumping in. I am thrilled with the background though and look forward to seeing what February brings. These look smashing........love the whole idea! Really cool looking, do you have flickr I would love to add these to my favorites. I like what you've created so far.